I went into my local public library and borrowed a copy of this book. 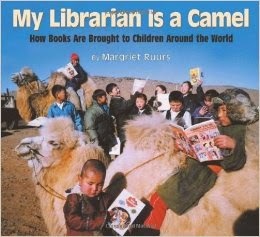 In My Librarian is a Camel, author Margriet Ruurs contacted librarians around the world and asked them to share their stories about their efforts to connect books with people. Whether it is at a refugee camp or a street corner, these mobile libraries are often the only way books can be transported. When we think of a library, we picture a building on a street or perhaps a room in a school. Some move from place to place in the most remarkable of ways: by bus, by boat, by elephant, by donkey, by train, even by wheelbarrow. Organized alphabetically by country, each two-page spread gives a brief explanation on how books are transported and includes color photos taken by the librarians in that country showing children laughing and enjoying books! In addition, an insert with map displays where the country is located, its flag, name of the capital, estimated population and country facts. My Librarian is a Camel is a wonderful book to share with students studying other cultures. Pair it with Material World by Peter Menzel. So glad you like my book! I had fun collecting the information and meeting amazing librarians all over the world. The results of this book have been amazing... Schools across North America have been supporting libraries in need of books or money. I've been able to help build a library in a Mayan village in Mexico and deliver books to kids in the Gobi desert. When Pakistan was struck by an earth quake, Oregon students helped to send lots of books to them because of My Librarian is a Camel! 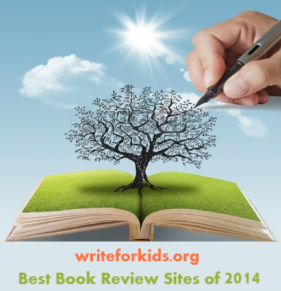 The next book in the 'series' is My School in The Rain Forest. 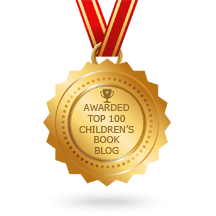 I also have 2 brand new titles with Kids Can Press: Families Around the World and School Days Around the World. Happy reading! Thanks for bringing this book to my attention--will definitely add it to our school's library collection. I'd display this one alongside Cynthia Cotten's The Book Boat's In, and two books about Colombia's "biblioburro," one by Jeanette Winter and one by Monica Brown.